Transformers: Prime season 2 is coming and with it is the toys. With this linkfest edition we have links to galleries of upcoming Prime toys and video reviews. Also a look at the latest WST toy, toy fair news, Generation 2 prototypes, DOTM contest winner and return of Marvel Transformers continuity. Finally we have reviews of several third party toys including the final components of Hercules, a Devastator upgrade kit, and interview with the narrator from the G1 cartoons. The next non movie wave of Transformers, based on the Transformers: Prime cartoon, is now about to get released. It has already been released in the UK and Japan. There are reports that Toys R Us stores in the US are starting to stock them. This means lots of galleries as the volume of links show. Over all have to say like the designs but at this point I am just glad to see something that isn't based on the movies. By the way, Hasbro once again decided to rename their classes, just to keep things confusing. There is Cyberverse (Legend), Revealers (Deluxe), and Powerizer (Voyager). I will stick with the old naming class scheme as just less confusing to me. 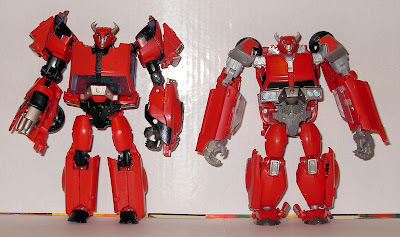 I separated this gallery out mainly because I liked the way it compared the two versions of Transformers: Prime Cliffjumper and shows how Takara engineers learn and improve on design resulting in two figures that are the same yet completely different. One of the things I love about Transformers is how they are fundamentally highly creative engineering problems. Hasbro creates the robot mode and alt mode and somehow the engineers figure out what needs to move, tuck, hide, and so forth to get from point A to B and back. With galleries must come reviews so hit those links to see what you might want to add to your buy list. 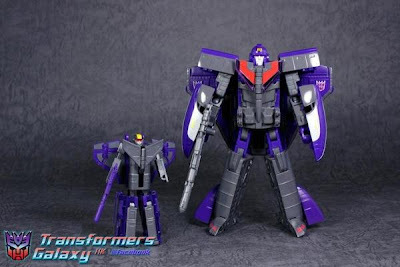 At the link is a gallery of WST Galaxy which is a tiny version of G1 Astrotrain. This is the next in JUSTITOYS line of World Smallest TFs that they have been making over the years. Not sure of release date or price. At the link are two videos from the Hong Kong Toy Fair 2012 that shows off the Transformers and Dark of the Moon accessories that are going to be available in the Asian market. A report from another toy fair brings news up new toys in the pipeline including new Transformers: Prime play sets and Kre-O sets. It seems the new sets will emphasize the tiny Kreon figures and leans to the G1 toys with some movie styles. Kre-O sets of interest include a G1 Optimus vs. G1 Megatron, a Devastator play set, and more. At the link is a look at prototype figures that Hasbro was apparently working on for their Generation 2 line that came out in the early 90s. 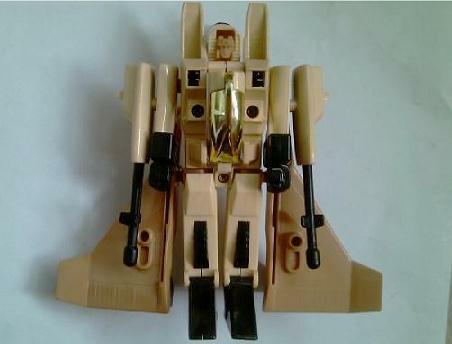 At the time it was a mix of new molds (bringing us Megatron as tank alt mode) and repaints of G1 toys. For reason I don't quite remember, I mostly ignored this line even though looking back I should have paid more attention to it. At the link are images of new paint jobs for the seeker molds, Stunticons and Protectibots. More close up images of the seekers are here. Long time Transformers writer Simon Furman recently spoke with CBR to promote the upcoming continuation of the Marvel Transformers continuity that is coming in May with Transformers #80.5. Issue #80 was published way back in 1991. It ended with a reformatted Cybertron (rebuilt after defeat of Unicron), reborn Optimus Prime, and defeated Decepticons. The plan is to pick things up 21 years down the line which is nothing to TFs but a lot of time on Earth. Furman: "I intend to waste no time pulling all the big players center stage, and kicking off the big arcs that will propel the book towards its conclusion in issue #100. There are three big, BIG storylines in issue #81 alone, all of which will re-shape the Regeneration One universe." Hit the link above for more information in the interview and a few images from issue #80.5. Below is video of Elijah Britain of Carriere, Mississippi who won the Dark of the Moon contest (I think from the September blu-ray release). His win gave him $1000 in Transformers toys (that he donated to charity), a tour of Hasbro studios and a ride in Optimus Prime and Bumblebee movie vehicles. The fifth and final toys for the not Devastator combiner (Hercules) from TFC toys. Similar to the previous toys. Nice detail, very G1-ish and expensive ($100). If you are willing to spend the $600 plus, this can be yours. Pretty much the best Transformers combiner created yet. For galleries click here and here. Below is the review of an upgrade kit for the G1 Devastator re-issue recently released by Takara in Japan. The kit gives the old combiner something he really didn't have before - articulation. It also comes with larger rifle and LED lighted eyes. The result is oddly more G1 like and looks pretty good. The import cost is around $130 for Devastator Re-issue and $35 for the upgrade kit. Here is an interview with Victor Caroli who narrated the opening "It is the year 2005..." in the animated movie and performed other narration duties for the Generation One cartoon and commercials. In the interview he spoke about the cartoon, passing on a role in the Bay movies and more. Speaking of the animated movie, it will premiere on The Hub at 9pm EST on February 18th, same day TF:Prime season 2 and Rescue Bots return. Congrats to boy:) These small robots are so cool!